This poor dog named Ipsie shown in the photos below was itching like CRAZY from her seasonal allergies to the point of hair loss, bleeding and scabbing on her back. 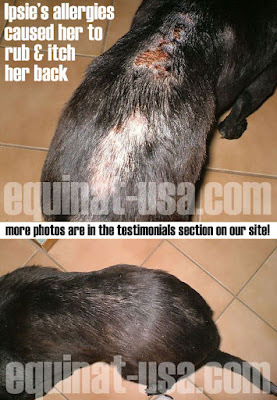 Her owner treated her with ALL NATURAL Dermacton he purchased from Equinat-USA.com and, much to his astonishment, Ipsie healed and is no longer itchy and and scabby. See Ipsie's complete story as written by her owner - including many more photographs here!